The pharaoh Ramses II will guide you to the fortunes of ancient Egypt. Make sure that you use all the 20 paylines across the 5 reels so you can cashin on the amazing bonus games. Collect 3, 4 or 5 Scarab symbols to activate the bonus feature. You can re-trigger the bonus feature from inside the bonus games. 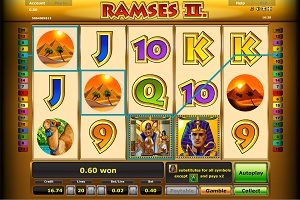 Graphics & Appearance: Greentube’s Ramses II slot machine is another full filled composition when it comes to the choice and display of symbols, colouring and design and an interesting theme. With its theme from the ancient pharaoh of Egypt, Greentube has chosen the dominant colouring as one can imagine the desert would appear during sunrise. Gamble Feature: The gamble feature can be used as soon as you have won a spin by clicking the Gamble button in the game window. This will take you to a 50/50 possibility to double your winnings. If you are successful, you can either choose to continue to gamble again or collect the winnings and return to the game. Game Symbols: The Ramses II symbol will substitute for all symbols and pay X 2 except for the scatter symbol which is the Scarab symbol. If you get 3, 4 or 5 Scarab symbols anywhere on the screen you will open the bonus feature and be awarded 15 bonus games. You will find numerous symbols from ancient Egypt in this game like the Sphinx and the Pyramid symbol for example. Obviously, there is a Camel symbol in there as well. The lower paying symbols are the 9, 10, Jack, Queen, King and the Ace. Bonus Feature: By getting 3, 4 or 5 Scarab symbols you will unlock the bonus feature. This means that you will be given 15 bonus games where all winnings are paid X 3. You will be able to re-trigger the bonus feature while you are playing the free spins. Betting Options: The Ramses II slot has 20 paylines across 5 reels. You can adjust a comfortable payline/stake limit by using the + and – buttons in the game window. Game Features: There is an Autoplay function on this game. In order to start the function, just click on the Autoplay button which is located under the reels, bottom right. If you wish to stop the Autoplay, simply click the Stop button. If you are using the function you will not be able to access the gamble feature. « More slotmachines guides Article last updated: Thursday, April 28, 2011.